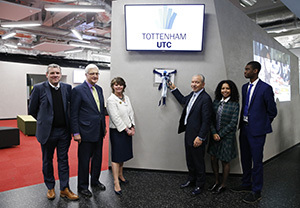 Lord Sugar, Britain’s best recognised entrepreneur, officially opened the University Technical College of Tottenham (TUTC), a partner institution of Middlesex University. The face of BBC's 'The Apprentice' and founder of technology company Amstrad met students aged 14-18 studying a curriculum of Science and Technology for Sport, Health and Engineering and was shown around the state-of-the-art facility in Tottenham's White Hart Lane. Middlesex University is one of the main sponsors of the TUTC alongside Tottenham Hotspur Football Club. The innovative University Technical College is also backed by a number of businesses from a range of industries, including Stansted Airport, Festo, National Instruments, Mindsets and Fusion Lifestyle. With students studying an employer-led curriculum, they are provided the opportunity to access careers within fields such as sports science, product design, computer science and design engineering. University Technical Colleges are a fairly recent education concept, which allow employers and universities to partner and offer young people technically-oriented study, meeting future employment and skills needs. The TUTC addresses a skills gap within an industry that requires 2.5 million engineers within the next seven years to contribute an extra £27 billion per year to the UK economy. At the official opening on 9 March Lord Sugar toured the facility, spoke to students and participated in a Q&A session with them. Lord Sugar, Chairman of Tottenham Hotspur between 1991 and 2001, said: "You cannot fail to be impressed by what the University Technical College of Tottenham offers to its students – a fantastic learning environment with an opportunity for students to get the skills they need to build a successful career. "The equipment that the students have at their disposal on a daily basis and the things they are able to do with it is truly mind-blowing, and I am convinced that we shall see future entrepreneurs and industry leaders come through this college." Middlesex University Head of Department and Vice-Chair Board of Governors of TUTC Prof Mehmet Karamanoglu said: "This is a very proud and memorable occasion. To see the Tottenham UTC finally come to fruition is a real success story for all of us involved and particularly for the local community. "It was great to see all the children showcase their newly acquired skills that will set them apart from their peers," continued Mehmet.